OESN is now offering Radon Testing in residential and public buildings! Contact us today for your free quotation! 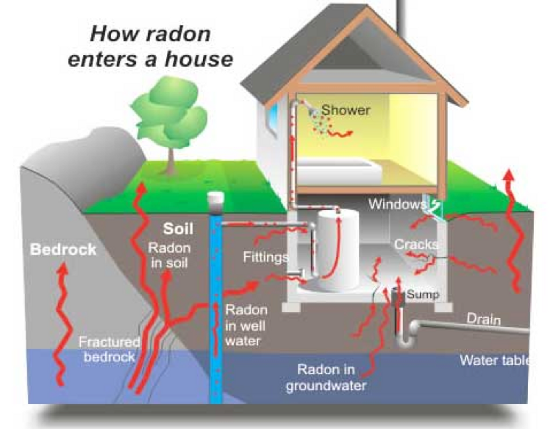 Radon is a colorless, odorless, and tasteless gas considered to be a radioactive carcinogen which causes lung cancer. Radon is naturally formed in the soil by the breakdown of Uranium in water, rock and soil; it is gradually released from the ground. When radon is released in the fresh air, it becomes diluted to low concentrations; however, when released in a confined space (or the basement of your home), concentrations have the potential to become dangerously high. In Canada, Radon exposure causes 3,200 lung cancer deaths per year. World Health Organization’s Dr. Maria Neira stated that, “Most Radon induced lung cancers occur from low and medium dose exposures in peoples’ homes. Radon is the second most important cause of lung cancer after smoking in many countries.” Every home has the possibility of containing radon, there are no areas of the country that are non-containing. Radon within the home has three contributing factors: negative air pressure differential from the soil to the interior of the building, a radon source, and a pathway into the home. Pathways into the home are numerous. The most common ones include: plumbing and electrical piping that has not been sealed, hollow block walls, cold joints between basement slab and basement walls, box outs for HVAC system drains, untrapped floor drains, curtain drains from basement to soil, sump pits, and exposed soil crawlspaces. The only way to know if there is Radon in your home, is to measure. Radon levels in a home can vary from day to day, so the most accurate way to find out if you have an issue is to measure radon levels in your home for at least 3 months. Health Canada recommends a long term test; this includes leaving a monitor in the testing area for a minimum of 91 days, while short term testing is anything less than 90 days. OESN conducts sampling for residential and public buildings, and is certified under the Canadian National Radon Proficiency Program (C-NRPP). The Canadian guidelines suggest safe levels of radon are below 200 Bq/m3. If levels between 200 and 600Bq/m3 are found, it is recommended to fix your home within 2 years; and if levels above 600 Bq/m3 are found within the space, it is recommended to you fix your home within one year.